New Wonder Woman details tease Diana’s team of ragtag soldiers. Richard Kelly is interested in making a new Donnie Darko. Finn Jones teases Danny Rand’s costume in Iron Fist. Plus, Talia al Ghul makes her full debut in Arrow, new footage from The Belko Experiment, and The Walking Dead’s midseason return. Spoilers! 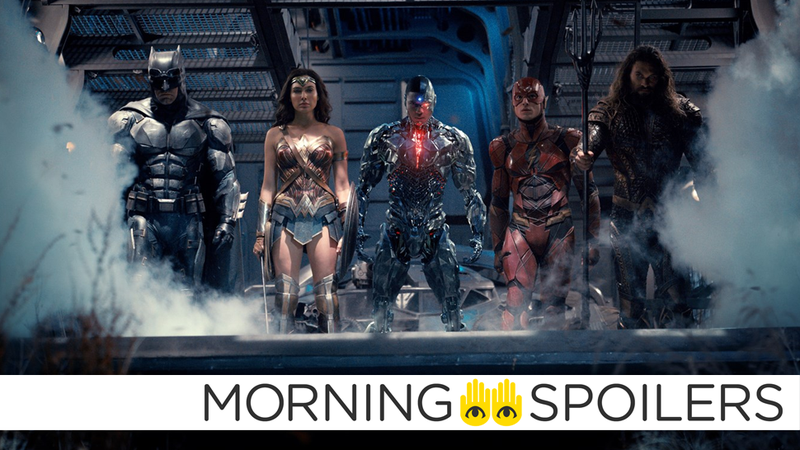 While Manganiello is not specific enough to clarify, but many anticipated that the footage was related to Justice League as it appeared to be shot on the set of large new aircraft Batman uses for the League in the movie. This isn’t exactly official confirmation, but it seems Deathstroke won’t be hitting the big screen until The Batman arrives. I play a character who’s enlisted by Wonder Woman to help save the world as part of a small, unlikely band. He’s a shellshocked soldier who’s been discharged from the war and is brought back to help on a secret mission. Perhaps said squad is the group of soldiers with her and Steve Trevor in the photo seen in Batman v Superman and the Wonder Woman trailers? This third trailer for the film contains a few bits of new footage of the office block-meets-Battle Royale horror film. So before I started the role, I actually made a playlist on my Ipod of songs that Danny Rand would listen to. It’s a lot of kind of 90’s hip-hop, like De La Soul, Jurassic 5, Tribe Called Quest, Wu Tang Clan. Like that kind of music is what Danny’s really jamming to. And we feature that in the series. And actually one of our episodes was directed by the RZA himself. Episode 6. So yeah there’s a very close tie with hiphop and the Iron Fist series. I mean, who says there’s going to be a costume? This is a modern... I can’t say any more. Marvel are going to kill me. There may be a costume, there may not be. Spoiler TV reports that Fox has allegedly ordered a pilot for the adaptation of the DC comics character. It’s not an official confirmation yet, and Black Lightning has yet to appear in Fox’s pilot acquisitions for the season, so take this with a pinch of salt for now. Wild Dog’s backstory will be revealed, according to the new synopsis for “Spectre of the Gun.” Side note: “Tensions run high in the Arrow bunker” should just be a sentence tagged to the end of every Arrow synopsis. Tawnia McKiernan directed the episode written by Robert Rovner and Cindy Lichtman. (212). Original airdate 2/13/17. When Jughead (Cole Sprouse) learns that an anonymous buyer has plans to tear down the local drive-in, he fights desperately to keep it open. Betty (Lili Reinhart) finds her friendship with Archie on the line after stumbling upon some startling information she’s uncovered about Miss Grundy’s (guest star Sarah Habel) past. Elsewhere, Veronica (Camila Mendes) confronts her mother Hermoine (Marisol Nichols) about a suspicious meeting she witnessed between her mother and a shady Southside Serpent. Finally, after uncovering Betty’s diary, Alice (Madchen Amick) finds the perfect opportunity to destroy Archie’s golden boy image. Madelaine Petsch and Luke Perry also star. A new promo for the midseason premiere has been released. Luke Cage and Jessica Jones get ready to rumble in new pictures from filming. Jon Bernthal glumly carries a bouquet of flowers in the least exciting Punisher set pictures ever captured. Maybe he’s hiding a satchel of grenades in there or something, who knows.